So explained Amani Ajaj, 39 years old, an Arabic teacher at Hizma’s elementary school and the mother of Adel Alkhatib (16 years old). 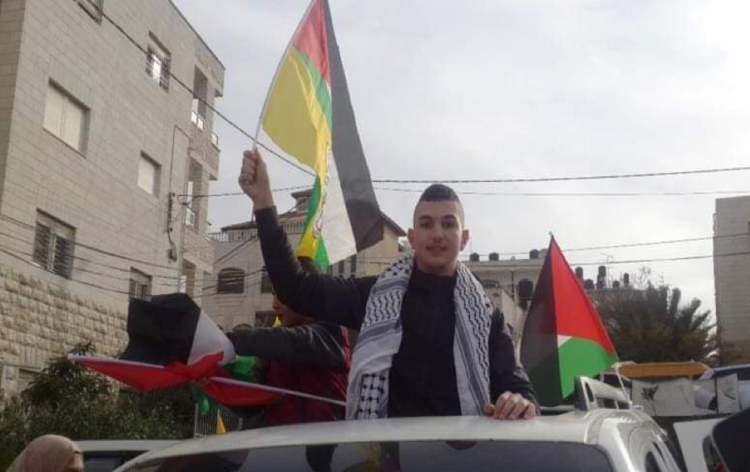 Adel was arrested last May, 2018, for throwing stones at an Israeli Jeep and a settlers’ car. His family is waiting the official prosecution which has been postponed, for the thirteenth time, this time until the 26th of January. The maltreatment of children has a continuous destructive impact on the mental health status of those children but also their families. For the past eight months, Adel has been in prison but he is not serving a prison sentence yet. He is, as many other children prisoners are, in stressful and Isolated locations like Hizma. The village is only seven kilometres away from Jerusalem’s old city but completely cut off from Jerusalem and West Bank by the apartheid wall in 2005. Families of Hizma struggle with continuous land confiscations that go to enlarge four surrounding Israeli squatter settlements; Neve Yaakov, Pisgat Ze’ev and Geva Binyamin and Almon. Although precious time is lost from their childhood, Amani like other mothers and children prisoners try to catch any spark of hope for her son’s future and education. Every year, hundreds of Palestinian children are brought before the Israeli penal system on different charges, including throwing stones, not having a permit when in Israel, membership in illegal associations and traffic. 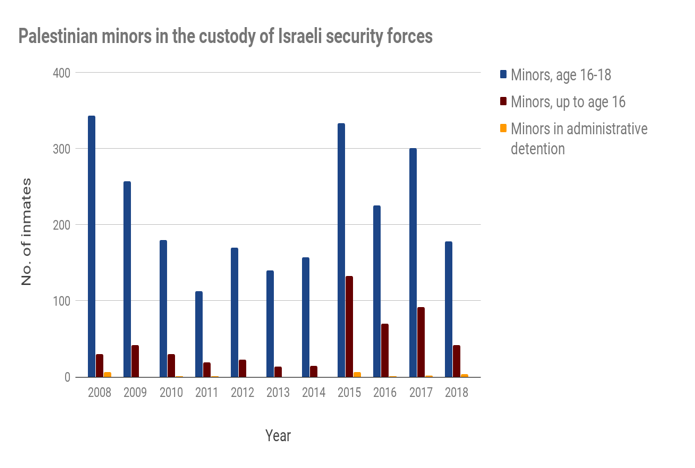 As of October, 2018 there were 220 Palestinian children held in Israeli prisons, according to Israel Prison Service (IPS) statistics published by B’Tselem, (an Israeli NGO for Human Rights). Since 1967, Israel has implemented two distinct legal systems towards Palestinian prisoners, in other words- Palestinians are tried in different courts with different laws for the same “offense.” In Jerusalem and those who hold the Israeli identity card, are prosecuted under civilian and criminal legal system, whereas children in the West Bank are tried in the Israeli military juvenile court. Israel’s ill treatment of children prisoners has been repeatedly, addressed, condemned and well-documented by various human rights organizations and watchdogs over the years with the same conclusions; children’s rights are regularly and systemically violated by Israel. Numerous annual reports for 2018 confirm the continuous abuse of children prisoners. The way in which the Israeli system mistreats and even tortures Palestinian detainees has been criticized by Amnesty recent annual report for 2017/2018 which disapproved the violation of international children’s rights laws and having no actual consequence for that. 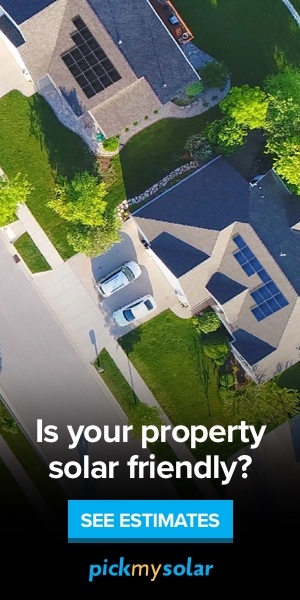 The report pinpoints that “No criminal investigations were opened into more than 1,000 complaints filed since 2001”. What makes this violation systematic according to Addameer (Prisoner Support and Human Rights Association), is the policies and laws that legitimize and provide a legal loophole for continuing torture against Palestinians suspected of withholding information on “militant operation” particularly Article 1/34 of the Israeli Penal Code of 1972 . Then there is the case of Shadi Farah. Shadi Farrah, first moments of liberty. On December the third 2018, Shadi Farah, now 15 years old, a Jerusalemite resident of Kafr Aqeb got out of an Israeli juvenile centre after three years of imprisonment. 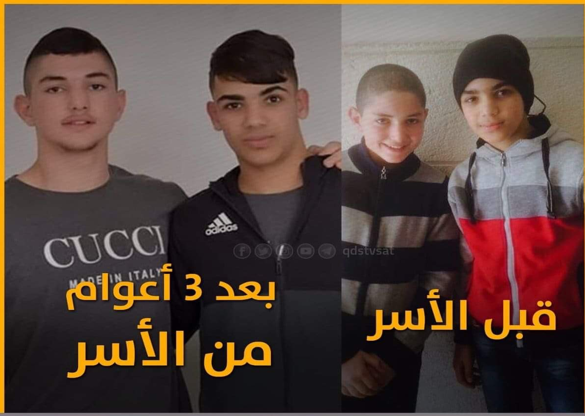 Shadi, one of the youngest Palestinian prisoners, was arrested with his friend Ahmad Zaatari on December 30, 2015 and prosecuted for an “attempt at stabbing Israelis solders” (again, he was 12 and he denies the charge). The final verdict was handed down on 2016 – a year after his arrest, the additional year went unaccounted for. Shadi clarified that people have no idea what goes on for Palestinian children inside the juvenile centres, which primarily hold Israeli criminals and offenders. Media attention on minor prisoners increased somewhat because of the celebrity of the teenage Ahed al-Tamimi who was sentenced for eight months in military Israeli court for slapping an Israeli soldier. Thousands gathered in the streets to welcome the freed children, since Palestinian society regards prisoners as heroes. Palestinian officials from the Ministry of Prisoners’ Affairs and the Palestinian Prisoners’ Society and media personnel are present. Getting out of Israeli prisons is cause for a special celebration. Families sing and dance and offer sweets. Reem Abd Ulhamid has a BA in communication and media studies from Birzeit University and an MA in global communications from the the American University of Paris. Abd Ulhamid has held numerous positions in media for over seven years and has served as researcher, editor, producer, and director for different organizations. Her most recent work is focused on developments in social media.